Calling All Artists in the Greater Vancouver Area! 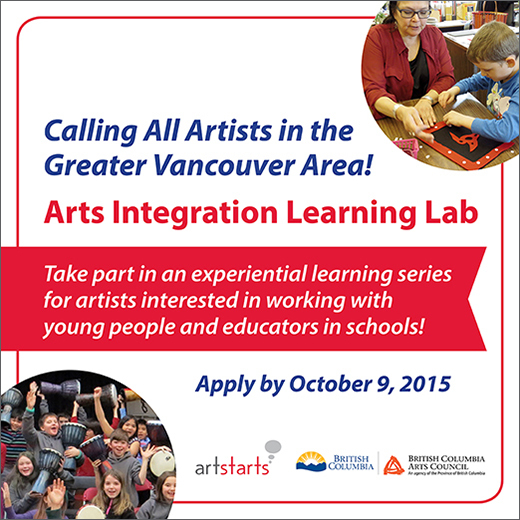 Apply by October 9, 2015 to take part in Arts Integration Learning Lab — an experiential learning series for artists interested in working with young people and educators in schools. Are you a professional artist interested in working with young people and educators in schools? Or do you already have some experience and want to enhance your skills? The Arts Integration Learning Lab is a professional development experience for artists of all disciplines in the Greater Vancouver area. This program is designed to build the capacity of professional artists and position them to work alongside educators in schools. The Arts Integration Learning Lab comprises a series of five practical, experiential learning sessions that will be offered once a month, from November 2015 to March 2016. The cost for artists selected to participate in the Arts Integration Learning Lab will be fully subsidized and covers: tuition, program materials and lunch. This opportunity was made possible through funding support from BC Arts Council and the Government of British Columbia's Creative Futures program. The Arts Integration Learning Lab is presented by ArtStarts in Schools, a not-for-profit organization that provides innovative arts programs for young people, practical resources for teachers and artists, and leadership in advocacy for arts in education. ArtStarts regularly offers Infusion professional development opportunities for artists and teachers interested in bringing the arts and arts integration into schools across BC.